I know series 2 has restarted in the States, I'm likely going to wait until the UK broadcast. (Why won't they announce a date? It's bad enough they didn't pick up Agent Carter!) I would appreciate no spoilers for the new episodes. 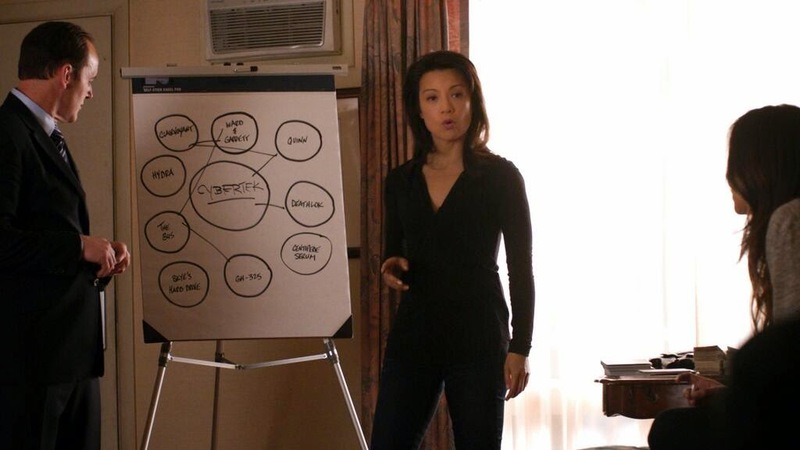 With Agent May returned and Maria Hill withdrawing any official support, Coulson briefs his team on their next step using a flip chart in a motel room. 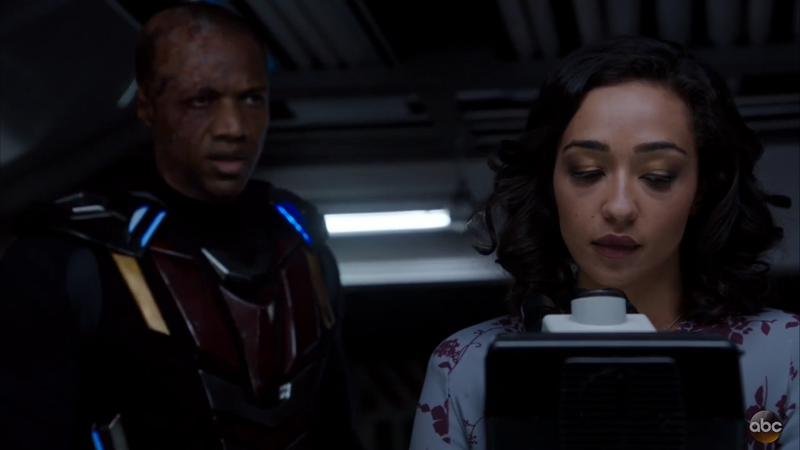 Skye's hard drive is in the hands of Garrett and Ward, but if she can plug her flash drive into one of their computers she can hack their systems. Everything they're facing is connected to Cybertek, so they go after the tech company using Trip's grandfather's old tech. On TV there are news reports of Deathlok killing a Colombia drug lord.There are flashback scenes of Garrett busting a young Ward out of juvenile detention and forcing him to be self-sufficient in the woods. 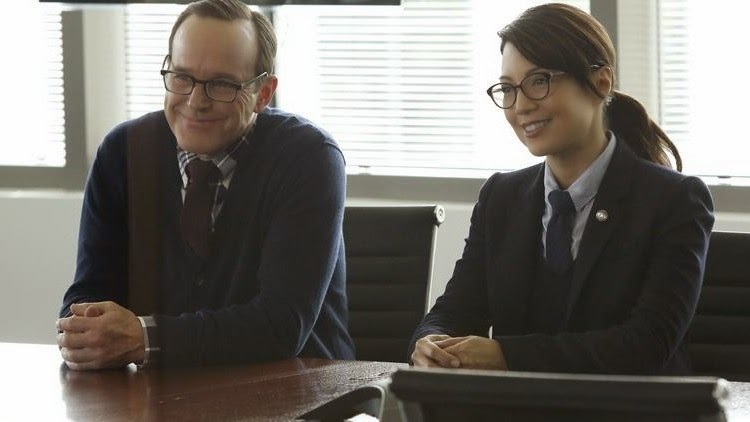 Coulson and May go to Cybertek for an interview, pretending to be scientists with help from Fitz and Simmons. Skye can't hack the system as everything is in physical files, so the agents steal some. The files reveal that Garrett was the first subject in Project Deathlok and is partly cybernetic. Raina has managed to recreate GH 325 using the info on Skye's drive but only has one vial. Garrett is dying and Ward has to temporarily restart his failing tech. The Shield team figure out Garrett is in Havana and track down the barbershop hideout, but it's already been abandoned. Fitz and Simmons find the plane and see the Hydra team preparing to leave. Ward finds them and takes them prisoner on the plane. A flashback shows Garrett telling younger Ward about Hydra and recruiting him to work secretly within Shield. Garrett's systems fail, he's dying and instructs Ward to kill Fitz and Simmons. The young agents initially escape, but Ward traps them in a container and despite pleading ejects it into the ocean. Raina has to inject the GH serum into Garrett's system to save him. In the seemingly abandoned barbershop basement Skye finds a computer and hacks into Garrett's system. The team are surrounded by Centipede super soldiers, one with an Asgardian beserker staff. Ian Quinn approaches US military type in Washington, offering them sell them a small army of super soldiers, Deathlok's high profile activities were an advert. Coulson is determined to track down and stop Garrett and Cybertek. Coulson geeks out over Trip's old-school spy kit, he's really into that stuff. A nice, happy moment between him and Trip. Gets into Cybertek playing pseudo-Fitz in the interview, made tricky (and hilarious) by having to ape Fitz's words. Chucks filing cabinet out of Cybertek's window to escape with intel. Realises how long Garrett's been augmented and working with Cybertek. Tells Skye that Fitz's defence of Ward is just what he needs to hold on to. May is back on the team and Coulson says he missed her. Coulson and May in the field together are great. She's pretending to be psuedo-Simmons and has a slightly more sensible audio guide. Skye suggests May doesn't feel anything, due to her calm exterior. May makes clear that she is furious about Ward, but she'll save her anger for when it's useful. In prison as a youth for trying to burn down the family home with his elder brother inside, there's no forgiveness from the Ward family. Garrett offers a chance for Grant to escape, though it'll be hard. Ward is left in wilderness to survive, he's angry at Garrett but proves himself and becomes loyal to him. Agrees to be in Hydra. Garrett orders Ward to kill his dog to overcome his weakness, but watching again it seems like he did but I don't think it's confirmed. It's clear that Ward has been helping and maintaining Garrett for years. Even when he's angry at Garrett he's still loyal and scared when it looks like Garrett might die. Killing Fitz and Simmons pains him and (like with the dog) he can't look them while he does it, but he's determined to overcome the weakness their affection brings out in him. It's all pretty twisted. Simmons tries to convince Fitz that Ward isn't worth his attempts to defend or justify his actions. When they're captured by Ward, she understands this is bad and accuses him of never caring for any of them. Fitz is now getting on better with Trip, impressed by the old spy tech (though in a more technical and less giddy way than Coulson). He keeps trying to defend or understand Ward's betrayal. He can't accept that a friend would do that and suggests brainwashing and manipulation, though everyone else rejects his suggestions. After being captured by Ward Fitz tries to get through to him, clearly imagining Garrett as the evil manipulator and Ward as his victim. Fitz doesn't understand the extent of Ward's betrayal until right at the end when he's begging for his life. Skye's Trojan Horse needs activating, so computer connected to Garrett's system must be found. When she can't find any digital signals she checks the building's specs and realises something is being protected on the fourth floor. Her skills are of less use when dealing with paper files. Raina asks Mike about Skye and tells Ward that she heard a story that might be about Skye's family. A whole Chinese village killed, Raina's story suggests the baby's parents were the killers. Trip gets his grandfather's old spy tech from his mum. The gadgets hidden in innocent looking objects are treated as an old style of tech. Trip works well with the team, following orders and finding stuff out. He's the one who figures out where Cybertek are hiding. Garrett is the original Deathlok and has had cybernetic upgrades since 1990. His work with Cybertek has all been to extend his own life, GH 325 was just the most likely of the avenues he's investigated. The Centipede serum has been all that's keeping him arrive, but his system is so bad it doesn't make him strong. Raina seems disappointed that Garrett doesn't share her interest in powered people, but just wants to preserve himself. Garrett's corrupting/recruiting of Ward is a major focus of the episode. Raina's success in creating a version of the GH 325 makse her one of the most effective of Team Evil. Both Ward and Garrett are unnerved by Raina. Quinn's the charismatic, public face of the enterprise, his ruthless business skills are put to selling their super soldiers to the US military. Coulson: I'll be damned if I'm gonna let Garrett and Ward get away with murder... and I want my plane back. After a Cybertek interviewer comments that Hydra scientists tend to be younger Simmons overcompensates over the comms. "May looks barely a day over... thirty. You're gorgeous." "Does your sweater itch?" "A little." Coulson: Skye, Trip, get ready for a large file transfer. Skye: How large is it?